Waters the 8 adjacent tiles every morning. 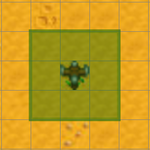 The Quality Sprinkler is a crafted item that waters the 8 adjacent tiles every morning (a 3x3 area). Only tilled tiles will be watered. The Quality Sprinkler is unlocked at Farming level 6, and is a reward for completing the Summer Crops Bundle in the Pantry. It can also randomly rotate into stock at the Traveling Cart for 1,350-2,250g. The Quality Sprinkler is not used in any bundles. The Quality Sprinkler is not used in any quests. This page was last modified on 15 April 2019, at 01:12.